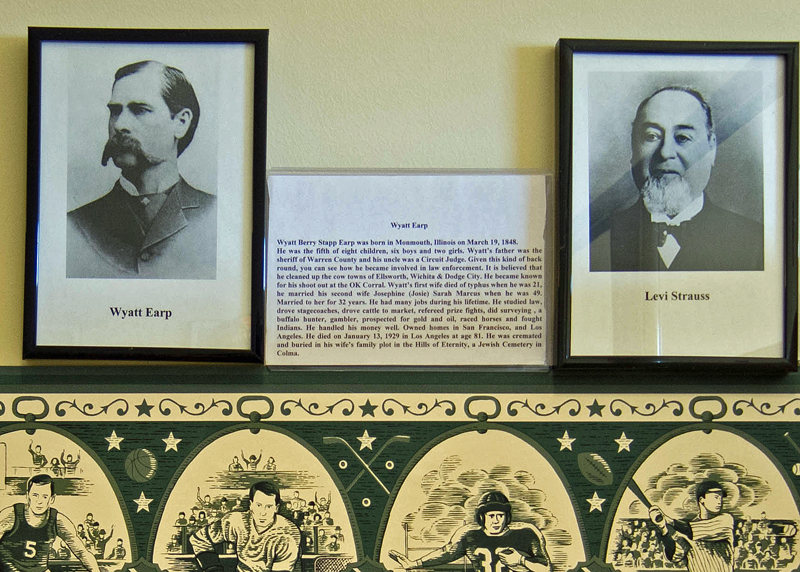 Wyatt Earp and Levi Straus hang together on the wall of the Colma Historical Society. 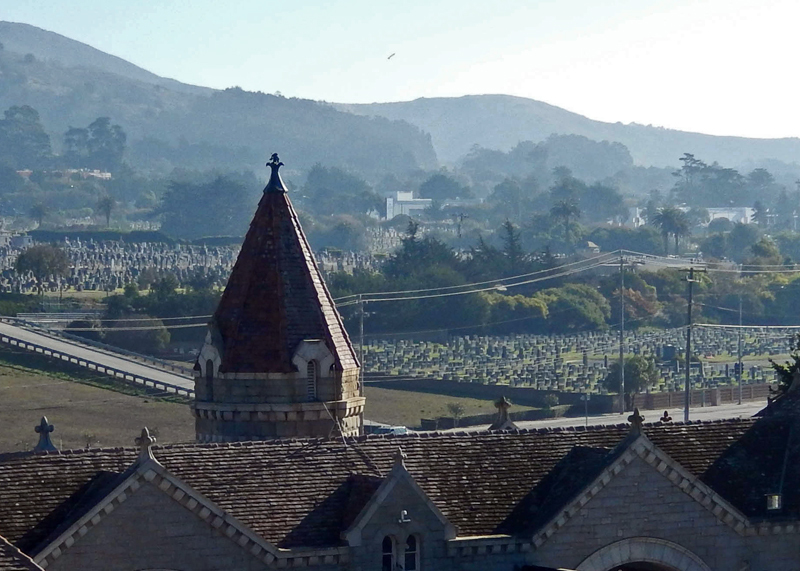 Life in Colma is focused on their memorial gardens as the cemeteries are called. Historically, the business district was limited to flower shops and monument show rooms, but the rules have been relaxed. Today there is a flourishing auto row along Serramonte Boulevard, which connects the cemeteries on Mission Street with those on El Camino. There is also a gambling casino, Lucky Chances, which boasts that it is the only casino in California with underground parking (for those too squeamish to go underground in Colma, the casino offers valet parking). But, my purpose was to visit the cemeteries to take pictures for a book review. So I went straight to the Colma Historical Association, which occupies the former Olivet Memorial Park streetcar depot. It was there that I discovered the photos of Wyatt Earp and Levi Strauss on the wall of the men’s room. That connection aside, both men were buried in Colma in the Hills of Eternity Memorial Park. Looking toward the Hills of Eternity Memorial Park from Woodlawn Memorial Park. Levi Strauss, businessman and inventor of the Levi Brand, died in 1902 in San Francisco at the age of 73. Strauss, being Jewish, was buried in Colma’s Jewish cemetery, The Hills of Eternity Memorial Park. Wyatt Earp died in Los Angeles and was cremated there. His wife Josephine, who’s family was Jewish, decided to bury him in the family plot at Hills of Eternity. If you find yourself alive in Colma, visit the Colma Historical Association on Mission Street across from Olivet Memorial Park. This entry was posted in San Francisco, Travel Blog and tagged Colma, Colma Historical Society., Levi Strauss, Photography, Postaweek, San Francisco, Wyatt Earp, ZeroToHero by carto. Bookmark the permalink.